warmer, snuggling, exploring and chewing on rawhides. 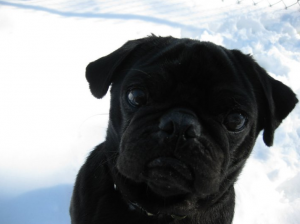 “Chumlee is a three year-old black, neutered male pug. He is up-to-date on his vaccinations, as well as tested negative for heartworm and intestinal parasites. Chumlee is such a sweet, lovable dog. He bonds quickly to his people and gets along well with the other dogs and cats in his foster home. Chumlee loves to play with his foster brother, go exploring in the yard and snuggle up with his foster mom and dad on the couch. He is currently recovering from surgery to correct luxating patellas on his back legs. He is crate trained as well as potty trained and will be working on his leash training as part of the recovery process.